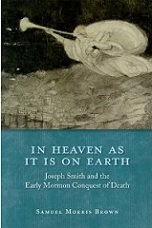 In Heaven as It Is on Earth: Joseph Smith and the Early Mormon Conquest of Death (Oxford University Press, 2012) reinterprets earliest Mormonism by viewing it through the lens of founder Joseph Smith Jr.’s complex, intimate, and conflicted relationship with death and dying. When approached from this perspective many of the unusual or striking aspects of earliest Mormonism begin to make sense, allowing outsiders and insiders a refreshing new look at a much-discussed but poorly understood religious tradition. In Heaven as It Is on Earth also provides insight to the ongoing problem of the tragedy of early mortality, an eloquent and complex response to death. This book site contains material excluded from the published volume (“Cutting Room Floor“), tangents of various sorts including book reviews, reflections on modern Mormonism, and devotional posts primarily for LDS readers, all under the menu option EXTRAS.